I grew up in Toronto and also lived in Burlington and places in between. Graduated high school and went on to Humber College to study Child & Youth Work. Not able to afford completion of my college program, one year off to make money turned into many, and with no idea what to do next, I packed up my car and drove across country to Vancouver. Life has continued to provide me with a very extensive education ever since through raising a family, gaining experience through a wide array of volunteer opportunities, and through work I have found myself on a path that has focused on service and helping others. I love people! After years of involvement as a community activist, I found that public education was my primary passion, and through experiences such as working on the Charter for Public Education, I have been exposed to a wide array of perspectives that continue to challenge my thinking. I have organized forums, attended conferences, facilitated workshops, and have been a speaker, panel member and emcee of a number of public events. I am always searching for ways to grow as a writer and advocate through hands on experience, and I also have a desire to communicate these issues to a broader public. 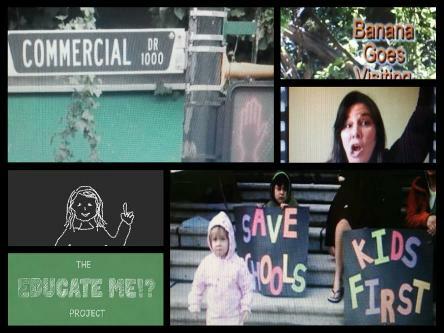 That is how the ideas began forming in my mind for a documentary of some kind to raise awareness of the impacts of privatization on public education. However, as I have pitched ideas, worked with various people to film a bunch of stuff and develop new proposals, and tried and failed a few times, I have come to learn a lot about every step of film production. I now know what I'm not good at, and what I have a knack for andreally love doing. I have found that I love playing with ideas, creating with others, using the camera to film as a new way to document things and tell a story, and I love getting lost in the editing process for hours on end. So, as the Educate Me Project continues to evolve, with a new focus on a series of short films instead of one long one, Saucy Side Productions continues to evolve as well. And now I'm filming anything and everything I want to while collaborating with others to continue to learn and have fun. Including the enjoyment of creating with my daughter working on her Sashaland Productions! I continue to quench my thirst for learning new things by spending time practicing my guitar, learning a new language, increasing the amount of food I can grow each year, and I work to enhance my skills in writing, film production, community development, sustainability and other things that interest me by volunteering, attending workshops, forums and lectures whenever I can. I'm around in the social media world of facebook (/positivekat), twitter (@positivekat) and tumblr (1positivekat) and you're welcome to follow along if you want to. Hug department is always open.